Futureworx is a proud contributor to ABC Life Literacy UpSkills For Work program. The UpSkills workbooks are intended as introductory explorations of the nine skills identified by Futureworx as foundations for success in the workplace. They do an excellent job of helping people develop greater self-awareness about their own skill levels. For some people, particularly those who face obstacles to getting or keeping work, further steps are needed. These steps can involve actually changing behaviours that impede success. But changing behaviours can be difficult, both for the person and for the facilitators whose role includes helping people train for and obtain work. Futureworx has worked to help people overcome behavioural barriers for over 35 years and, with the support of The Counselling Foundation of Canada, has developed a tool that allows these employability skills to be addressed with intent, in a client centred, evidence based and respectful manner. 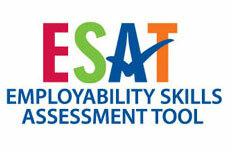 The Employability Skills Assessment Tool, ESAT, supports the assessment and development of the nine skills, and can be adjusted to address other skills needed for a given program or employment sector. Curriculum resources are also available for those organizations who want to take the employability skills journey a little deeper. Click on the link below for more details on ESAT, or contact us at [email protected].